Product prices and availability are accurate as of 2019-04-13 23:59:29 EDT and are subject to change. Any price and availability information displayed on http://www.amazon.com/ at the time of purchase will apply to the purchase of this product. T250A-F16 Features: -Preferred 16 gauge system offers less wood splitting and smaller nail holes.-Tool-free adjustable depth of drive provides precise control of nail depth in hard or soft wood.-Lightweight yet powerful: minimizes user fatigue without sacrificing power.-Directional exhaust cap allows you to easily change the direction of exhaust/dust.-Nail lockout at 10 nails prevents blank fire damage to work surface.-Soft textured grip decreases user fatigue during all-day use.-Reversible/removable belt hook is convenient during overhead and ladder work.-Rear load magazine with two-step follower allows for faster, easier nail loading.-Applications: baseboard and shoe molding, cabinetry, chair rails, crown molding, door and window casings, door jambs and stops, paneling, stair assemblies, and pick-up and service work.-Cycle rate: 5 nails/second.-Nail capacity: 100 (2 strips).-Magazine type: angled.-Air req./80 PSI: .040/cycle.-Op. pres. 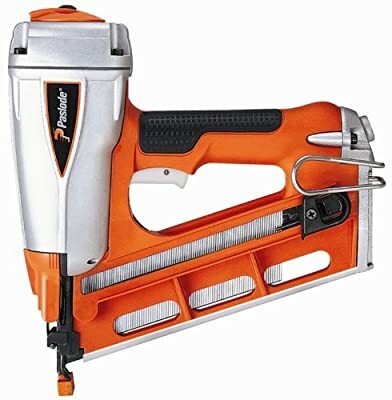 PSI (bar): 80-120.-Fastener type: 16 gauge.-Collation angle: 20 degrees.-Rugged plastic carrying case.-Extra no-mar tip.-Owner's manual.-Quick reference set-up and cleaning guides.-Safety glasses. Color/Finish: -Compact, angled design allows you to reach into tighter spots than with straight finish tools. Dimensions: -Fastener length: 1-1/4'' to 2-1/2''.-Weight: 3.8 lbs..-Height: 11.3''.-Length: 10.8''.